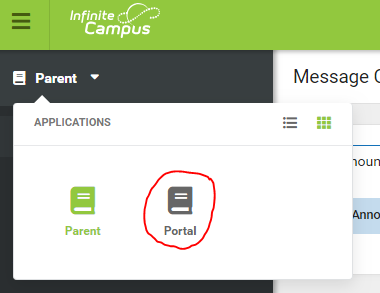 Infinite Campus Messenger is used to send alerts and information out to parents/guardians and students. The types of messages Infinite Campus Messenger sends includes emergency, school cancellations, early dismissals, general information, teacher notifications, behavior notifications, and lunch account notices. You may choose to receive some or all of these alerts by email, text message or phone call. Follow the directions below to set your alert preferences. 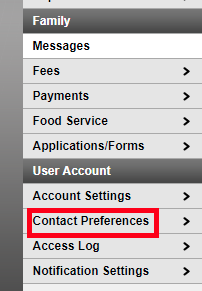 You will need an Infinite Campus Portal account to set up your Infinite Campus Messenger preferences. If you do not already have an account, please email jchristenson@clearlakeschools.org and include the name and date of birth of your student to establish an account. Log into the Infinite Campus Portal. If your screen looks like the image below, you are in the Campus Parent view and not the Portal view. Click Parent>Portal to switch to the Portal view. Click Contact Preferences along the left-hand side of the portal page. Check the appropriate boxes to indicate which types of notifications you want to receive and how you want to receive them (see alert descriptions below). When you are finished, click the Save button at the bottom of the page. To change or add a phone number or email address, contact the office of the school building where your child attends. Emergency notifications will be sent to all guardians in the event of an emergency situation. You cannot opt in or out of this type of message. Emergency notifications are sent to all phone numbers, email addresses and text message numbers the district has on file for student guardians. Notifications related to activities and other general information. You may choose to receive general notifications by phone, email and/or text message (SMS). Notifications regarding the attendance of your student such as an absence or tardy. You may choose to receive attendance notifications by phone, email and/or text message (SMS). Notifications from your student's teachers including general information from the teacher, missing assignments and failing grades. You may choose to receive teacher notifications by email only. Notifications regarding the behavior of your student. 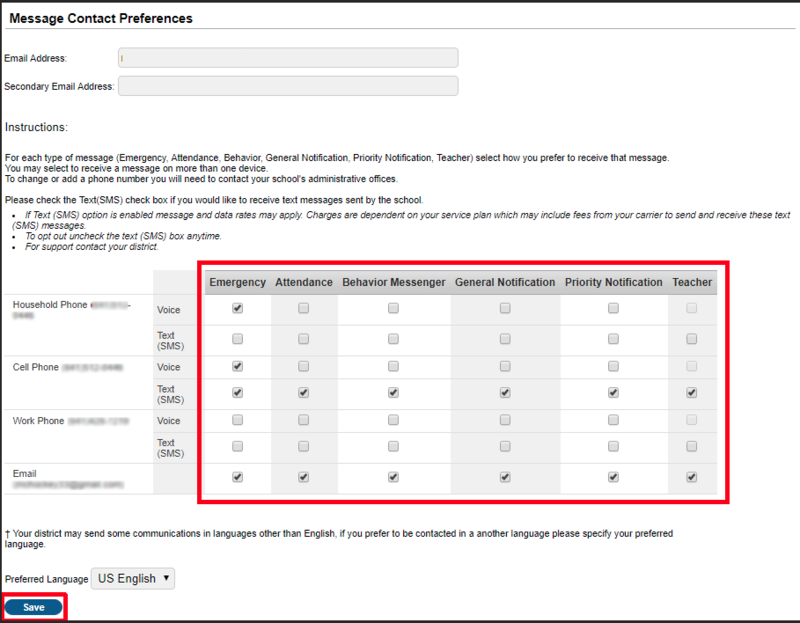 You may choose to receive behavior notifications by phone, email and/or text message (SMS).